Back To Homeschool season isn’t quite here yet, but that doesn’t mean we can’t start planning! Part of planning means stocking up on school supplies and who doesn’t like that? My kids and I love going to the office supply store and stocking up for the year! And then they love when we go back again halfway through our year! Before we can actually do the shopping for school supplies, I make sure to sit down and make a list of all the supplies we will need. And what better way to do that than with a printable! You can grab your free school supplies printable below and use it in a few ways. Print one out at the beginning of your school year, when you know you have to do your school supply shopping. Then, you’ll likely have to print another one halfway through your year, when your supplies are running low. Or…you could do what I do and keep a master supply list. At the beginning of our school year, usually in August when the sales hit, I make a big master list of any school supplies we will need throughout the year. I go through my Teacher Guides and any science experiments, crafts or projects we will do etc. Sometimes I fill two pages. Then, I laminate my sheets and put them in my Homeschool Planner. Throughout the year, when I am running low on something, I either use a dry erase market to highlight what I need, or highlight it with transparent washi tape. Sometimes the dry erase marker will rub off in my planner, hence the washi tape. When I’m out at the store, I grab the supplies we are low on, and clean off my School Supply sheet. Simple. 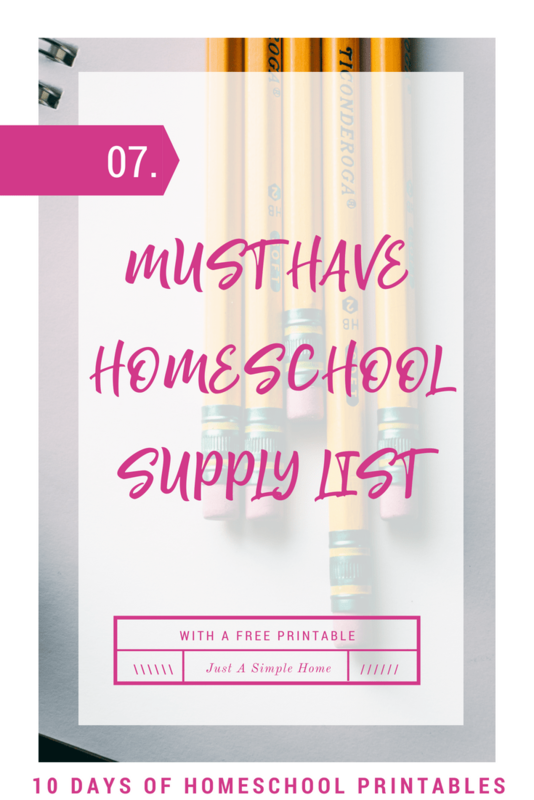 I have a list of Must Have Homeschool Supplies to give you a jumping off point when creating your list. This printable is part of the Simplified Homeschool Planner. This post is part of the 10 Days of Homeschool Printables series. Click the button below to get all your free printables!